Our trained staff will be glad to take care of your pet’s grooming needs - whether that involves giving a bath, clipping nails, or providing a full body groom. If you’re booking these services in conjunction with daycare or boarding, please make the grooming reservation in advance as well to ensure your spot on the schedule. Grooming services are available by appointment only. Dawn is available for grooming on Monday, Tuesday, Thursday, Friday & Saturday. Pick-up times vary. Our office is open from 4-7pm or call to arrange a time that is convenient for you. Your pet may be finished before the scheduled pick-up time. If this is the case, you will be contacted by phone. Grooming pick-up will be available outside of our regular office hours by appointment. During your pet's stay, he/she will have access to fresh water and given restroom breaks as needed. Treats are also available. You are welcome to bring a small toy or a few treats for his/her spa day. Please remind us at pick-up if you brought extra goodies for the visit. We require the following up-to-date vaccinations for grooming: Rabies, Bordetella, Distemper, and Flu. Clean as a Whistle: Includes bath, blow dry, nail trim, and ear cleaning. We will finish off the treatment with a spritz of cologne. Head-to-Toe Tidy: Includes a bath and blow dry, followed by an all-over haircut or breed specific trim. Includes ear cleaning and nail trim. Nails: Trimming nails can be tricky but we are dedicated to help. Nail trims are included in all of our grooming packages but may be done as a standalone service upon request. De-shedding Package: Includes our Furminator shampoo and conditioner that helps thin the dog’s undercoat and reduce shedding. Blow drying dries and fluffs the coat while helping to expel the excess hair. Includes nail trim and ear cleaning. Summer Cut: Takes the coat short all over, leaving the fur 1/8 inch or less on the body. 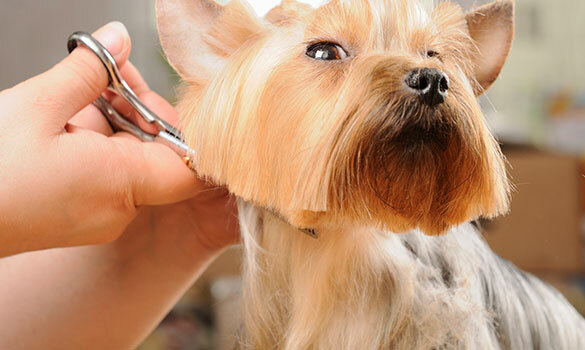 Winter Cut: Trims the coat while still leaving plenty of fur for the colder winter months. Puppy Cut: Evens up the coat all over and leaves the fur the same length. Typically, the fur is clipped to 2 inches or less in length. Teddy Bear Cut: The fur on the body is taken to the owner’s desired short length. The legs and face are left full and rounded. Lion Cut: The body is shaved leaving the fur around the face, head, part of the chest, and a small portion of the shoulders. The feet, ankles, and tip of the tail are left. Neaten Up: For dogs with feathering on the legs and tail, or even if you’re looking to keep the dog’s current length, this trims stray hair on the face, skirt, legs, feet, and tail. Leave 1/16 inch on: Takes the fur down nearly to the skin. Great for summer cuts and sanitary shaves. Leave 1/8 inch on: Great for slightly longer summer cuts and for removing heavy matting from the coat. Leave 1/4 inch on: Useful length for removing light matting from the dog’s coat. Leave 3/8 inch on: Great for neatening up the fur on the body and for winter cuts.